You are invited to our second BeWell family cooking event of the year on April 27th! 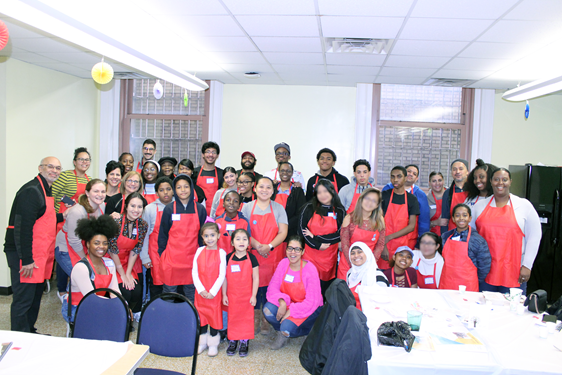 We had our first family cooking event in December 2018 and had so much fun cooking healthy lasagna, making smoothies, and eating healthy desserts. We can’t wait to have our second family cooking event on April 27th. In case you missed it, here is the recipe for the healthy zucchini lasagna that we made! First layer: Spread a layer of cheesy tomato sauce evenly on the bottom of the pan. Cover sauce with 3 sheets of lasagna noodles. Cover noodles with a layer of zucchini. Second layer: Repeat first layer. Third layer: Top layers 1 and 2 with the remaining cheesy tomato sauce and finish by sprinkling the reserved mozzarella and Parmesan cheese. Step 7: Cover tightly with foil and bake about 30 minutes. Step 8: remove from oven, remove foil and bake uncovered until cheese starts to brown slightly, about 15 minutes. Step 9: Let lasagna stand at least 10 minutes before serving. The event this spring will be held at Teacher’s College and we can’t wait to share all new healthy recipes with you! Ask your health coach for more information, we’re looking forward to seeing you there!